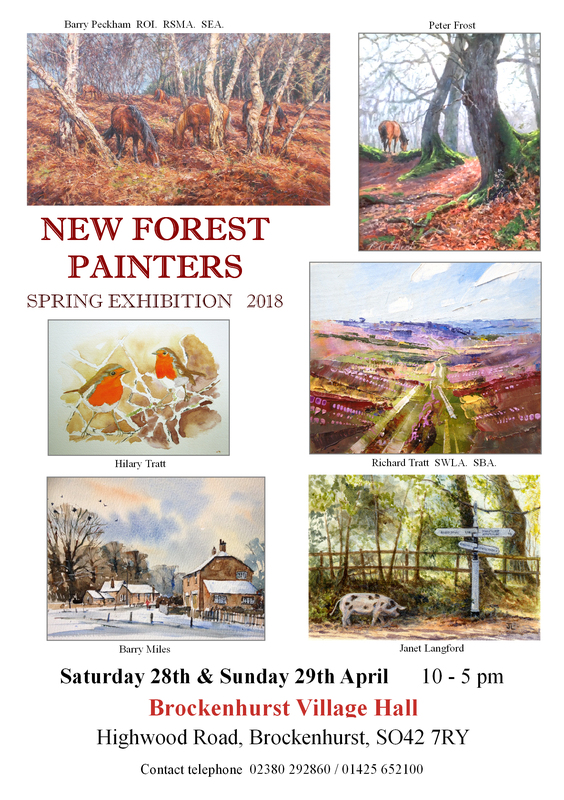 New Forest Painters 20th Annual Spring Exhibition 2018. If you are interested in art and love the New Forest then a visit to the New Forest Painters Annual Spring Exhibition will not disappoint. Six artists with very different styles and techniques gather annually to display their work produced over the last twelve months. The theme of the exhibition is the New Forest with its ancient woodland, wild heaths and a coastline over- looking the Solent. This provides a never ending source of inspiration and the diversity of painting styles and the subjects chosen by the artists create an exhibition of great variety. A popular addition to the exhibition has been the inclusion of a small collection of works produced in other parts of Britain during painting trips. Barry Peckham ROI. RSMA . SEA. Peter Frost and Janet Langford. The collection of detailed nature studies , fine miniatures , bold watercolours , carefully composed studio paintings and works produced out of doors directly from nature are all a part of this exciting exhibition.